The furniture was made to my specification and was painted with @DecoArt Chalky Finish Paint. The colour used is called Everlasting, a very soft white. This paint is so easy to use and gives excellent coverage when updating furniture and accessories. The best thing is no priming or sanding is required; this saves lots of time and effort. I love the trolley/cart purchased from @Hobbycraft and painted some accessories to match it using DecoArt Multi Purpose Paint in Soft Jade – what a great match! This chandelier was in the attic for around 20 years! It was really rusty and, to be honest looked ok but not quite the look I wanted. I removed the original drops and replaced them with a selection of coloured crystal ones. I didn’t have any purple ones so I coloured a few with a purple Sharpie to co-ordinate with the velvet sofa (you could also use DecoArt Glass Paint). After painting it with the Soft Jade paint I sanded it in parts to give a more vintage look. The piece de resistance for me is the armoire. 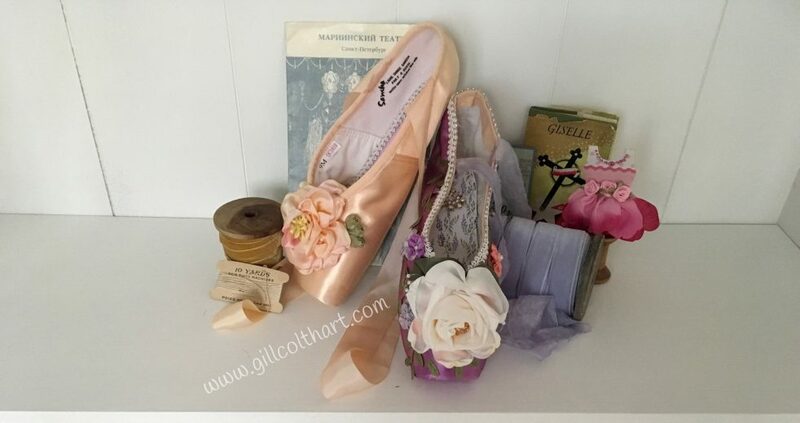 It was made to my spec and holds lots of my favourite things, including pointe shoes I decorate with hand crafted silk ribbon roses. The bottom drawer holds fabric and embroidery hoops. I found this garland @The Range at a bargain price of £10.99 and glued on a few more roses for effect. You can never have too many roses!! I have had this book for almost 70 years! It is huge and I can only imagine how I must have felt owning this book that was probably taller than I was! A get well card from my headmistress and school friends when I was 14! Every craft room needs a pin board – I may decorate this at a future date, but don’t want it to look too fussy. It currently holds an eclectic mix of fabric painting, embroidery, tatting, silk ribbon flowers and hand made jewellery. The best artificial flowers ever are from Bloom UK – this is their meadow flowers arrangement. Apart from the fact that it’s the wrong time of year I would defy anyone to notice they are not real. I knew exactly what I wanted and was very lucky. I feel so lucky to have this place to create, relax and display all these little things that mean so much to me. Thanks for visiting – please leave a comment and come back to the shed soon!